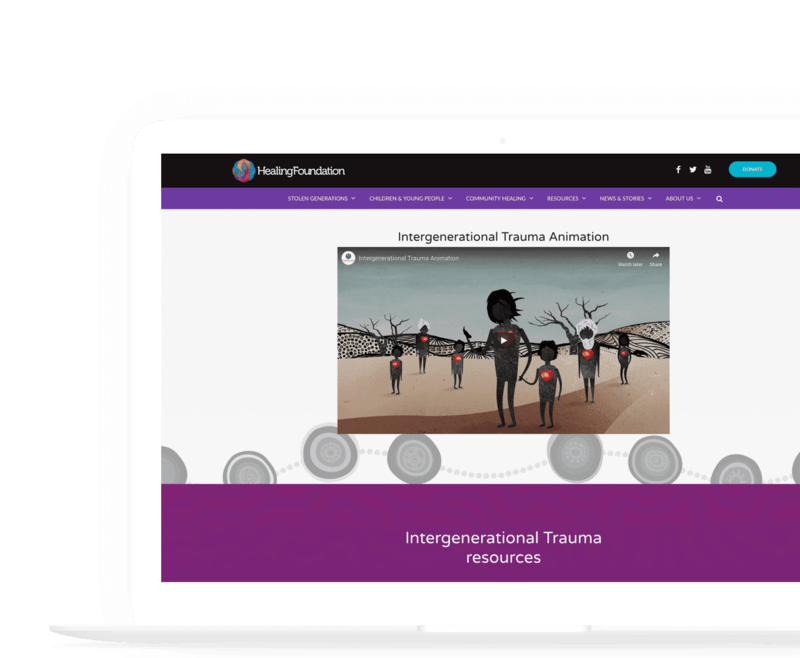 Built platform to showcase the services the national Foundation provides, working with communities to address trauma and research Indigenous healing. Having had experience working on other indigenous Australian projects such as the ILC and the Yidaki exhibition for SA Museum, The Digital Embassy were approached to build a platform to showcase the services the Foundation provides, as well as access to an array of educational and training programs, and activities that help support local communities. A secondary goal was for the website to have the necessary functions to be able to accept and process online donations through a consistent and visually appealing site rebrand. 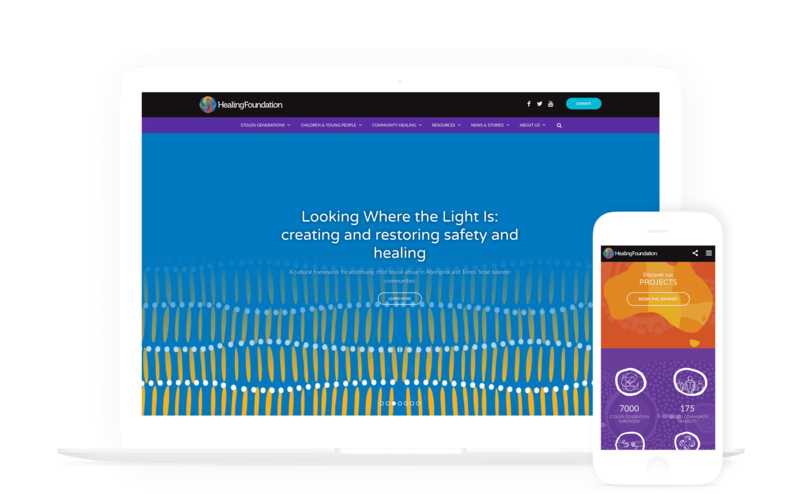 The task was to build and deliver a website that is easy to use, visually compelling and clearly communicates the Healing Foundation’s work to its target audiences. This would be facilitated through a series of strategy meetings held with The Digital Embassy and client project stakeholders with the purpose of gaining an in-depth understanding the organisation’s desired audience, and strategic goals for the project. Insights gained from this process would be used facilitate the creation of the website’s project scope including the functional build specification, wireframes, user centered design approach and content strategy. It was determined that the new website would need to contain features that would support greater levels of design consistency, while accommodating user case requirements for ease of use to access appropriate resources within the website. This would include the use of bolder, richer imagery (within back ground, within articles and template) and more effective use of white space throughout the site. 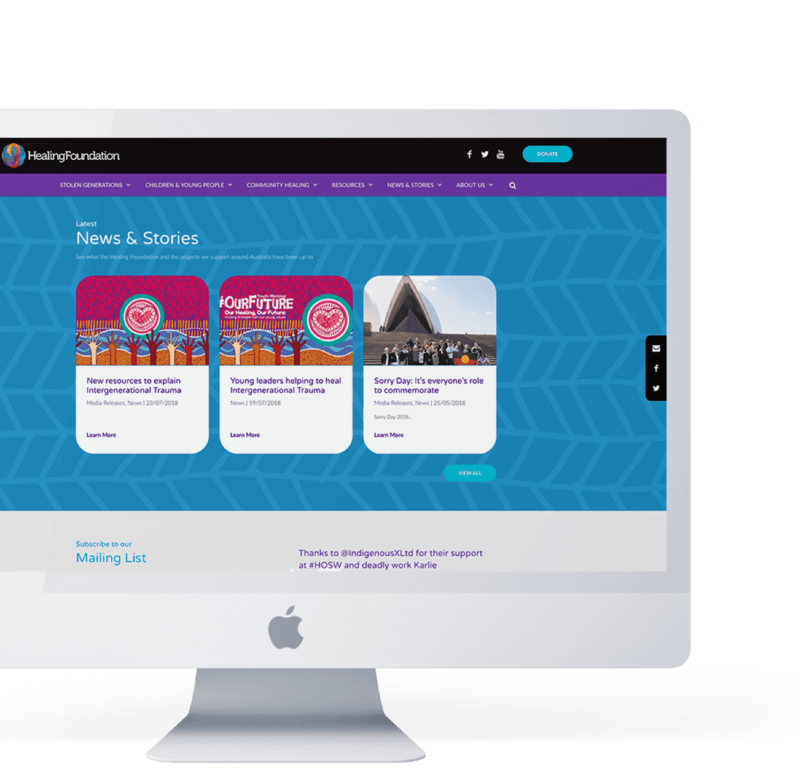 Through an improved design interface, the new website is able to more effectively enable the Healing Foundation to communicate their core brand values and messages. As part of this approach the website focuses on presenting traditional Australian indigenous artworks, and featuring a colour palette specifically chosen by stolen generation elders. WordPress was selected as the most suitable CMS platform as it allowed for frequent content updates in an easy manner. New information architecture was developed as part of the new build. This would include provision for larger banners and imagery was developed into the new website templates to provide a consistent experience globally. 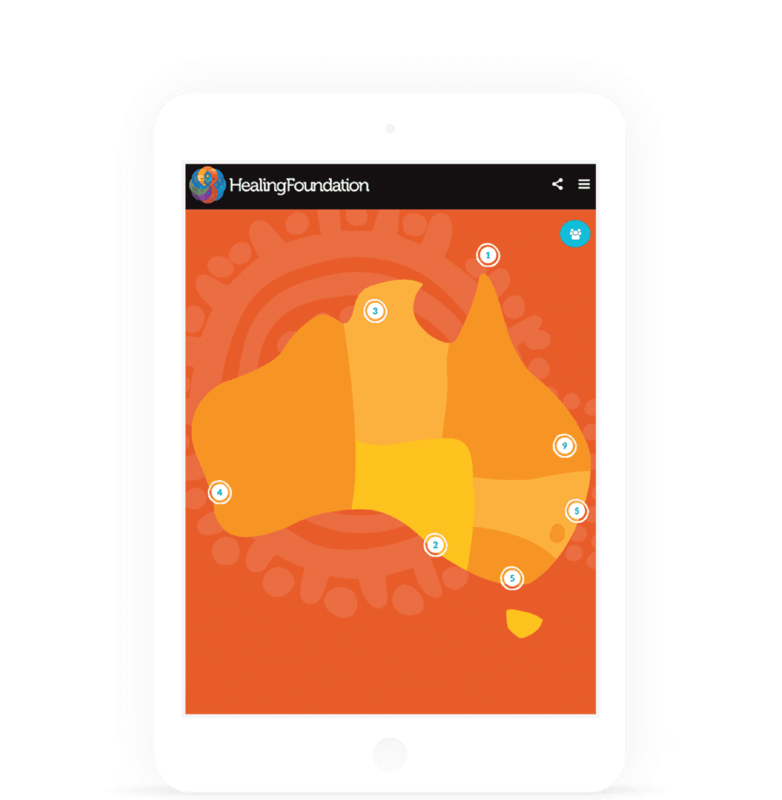 The navigation on the new Healing Foundation website was redeveloped to best practice standards for both mobile and desktop devices. The Resource section of the new website was enhanced to be easier to use, searchable and visually appealing with a strong emphasis on the publication formats. Twitter feed integration was also developed and incorporated to provide a seamless responsive experience. News and Events features (presents feature articles on the home page). 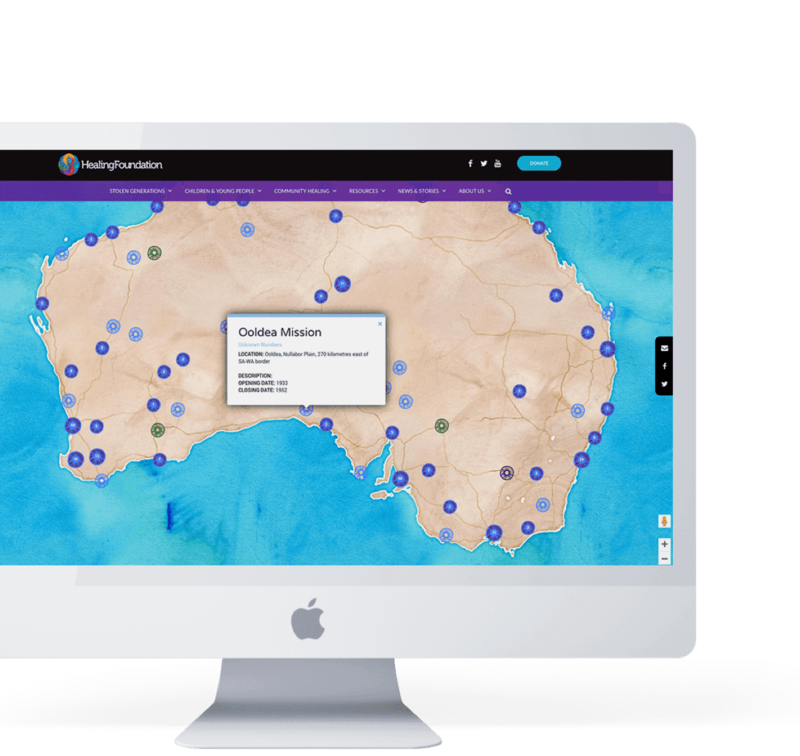 An interactive map was built within the homepage to showcase the various Aboriginal and Torres Strait Islander healing projects, case studies and programs across Australia. This feature not only allows for easy and quick navigation of healing projects and programs but also a function that enhances user engagement within the website. The Healing Foundation’s goal was to reach people of all ages, gender, and location. Therefore a positive and informative tone of voice was used across the website, in order to place the Foundation as an industry knowledge leader. Content across the website needed to be relevant and engaging to all audience types. Importance was placed on it being interesting and useful, whilst maintaining the sensitivity behind the subject of the website. To further enhance the sense of community, quotes and testimonials were included throughout. While the ‘Contact Us’ feature across the website was developed as a primary call to action, other additional features such as the email subscription and a resource center were implemented for users that prefer to access further information. Incorporating Advanced Analytics tracking into the website build process allows for supervision over useful information, such as user interactions with the website and the sources from which they were directed. 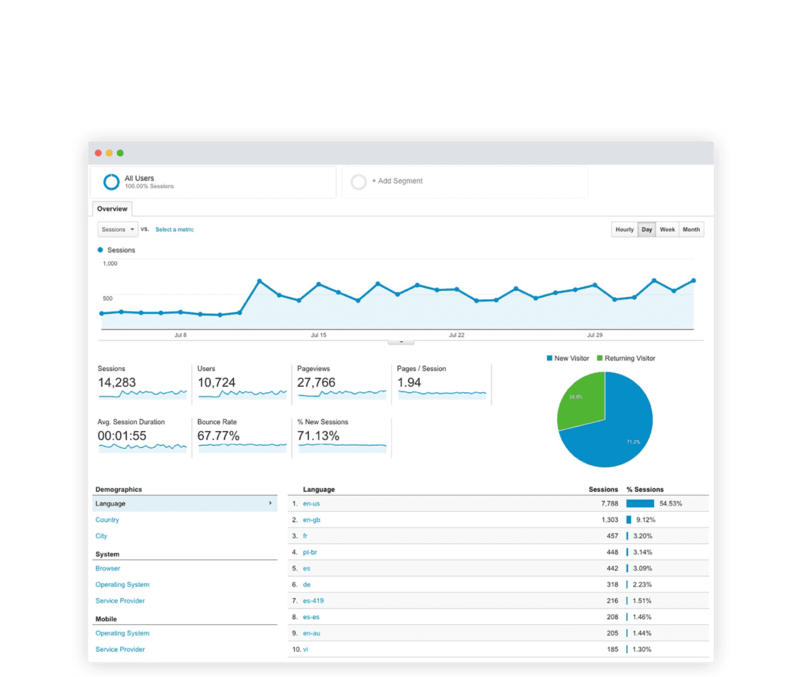 The valuable information gathered through Google Analytics can be used as a guide to develop marketing strategies, populate further content on popular website pages and other digital initiatives. To assist Healing Foundation site administrators with content maintenance, The Digital Embassy™ developed content style definitions which are predefined as part of the website template. 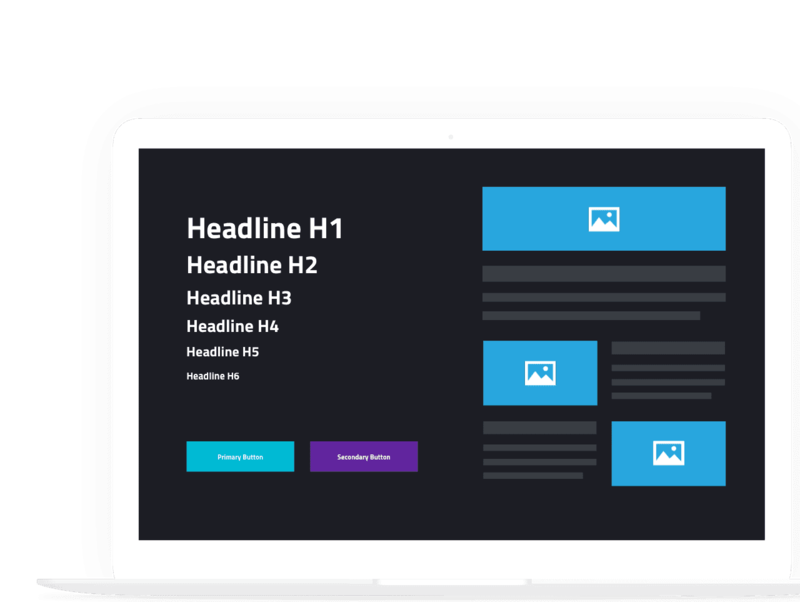 These enabled the Healing Foundation to enter visually consistent content – for example, predefined heading styles, paragraphs which include images, and list elements can be set up so that their website administrators can easily add new content in dynamic layouts. As an award-winning Digital Agency, we partner with global technology leaders as part of our commitment to maintaining standards of certified excellence and quality assurance. Want to start a project with us? Let’s discuss your requirements over a coffee at our place! © Copyright The Digital Embassy | Web Design & Digital Agency 2019.